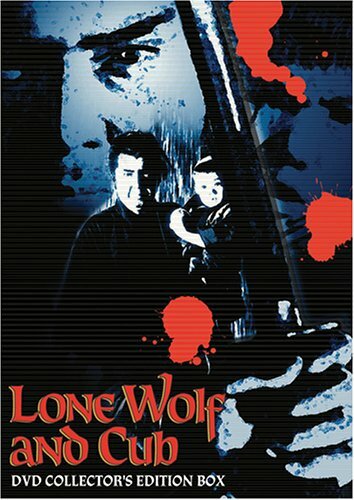 The LONE WOLF AND CUB series chronicles the adventures of disgraced Shogun assassin Ogami Itto and his infant son Daigoro, who sell their services to people in need while traveling the countryside in search of revenge against the hit squad who killed Itto's wife. All six parts of the martial arts-based drama are included here. In the first film of the series, SWORD OF VENGEANCE, Ogami escapes with his son in a wooden baby cart after an assassination attempt on his family. The second film, BABY CART AT THE RIVER STYX, sees Ogami stalked by a deadly female ninja as he attempts to assassinate a spy from the Shogunate. The journey continues in BABY CART TO HADES, with Ogami coming to the aid of a prostitute who killed her pimp. But he has to undergo torture to win back her freedom. In the follow-up, BABY CART IN PERIL, Ogami must battle a female martial arts master and defend his son from an assassination attempt by an enemy clan. The fifth film in the saga, BABY CART IN THE LAND OF DEMONS, features a duel between Ogami and five warriors who hold not only his assassin's fee, but vital information he needs to hunt down his enemies. Then, in the sixth and final installment in the LONE WOLF series, titled WHITE HEAVEN IN HELL, Ogami faces his ultimate challenge when all remaining members of the enemy Retsudo clan band together for a face-off on a snowy battlefield.